Eating out this summer with family? Maybe you are going on vacation, going to grandma’s house or just out for a weekend drive. We all stop somewhere to eat on the way. You may want to read this article by the American Heart Association to help you make healthier choices for your family this summer. Starting May 21, 2018 things are changing – I think for the better. It’s officially easier to find out how many calories are in that chicken sandwich or cheeseburger. Starting Monday, calorie information must appear on menus at major restaurants and other places that sell restaurant-style foods such as supermarkets, convenience stores and movie theaters, according to a Food and Drug Administration policy. The policy applies to companies with 20 locations or more. FDA officials say the measure is designed to inspire Americans to make informed, healthier choices while encouraging food producers to offer lower-calorie options. “As someone who enjoys eating out with my family and picking up the occasional take-out meal, I – like many Americans – want to know what’s in the food I eat,” FDA Commissioner Scott Gottlieb said in a statement. Americans love to dine out – to the tune of about $3,000 a year per household. But the dollars have been far easier to calculate than the calories. Unlike packaged food, which comes with a nutrition label, there’s been no transparency about the calories count in restaurant food, popcorn and even cocktails. That information is important, health experts say, because there are typically just more calories outside the home. People typically eat 20 percent to 40 percent more calories than they would at home, experts say. Those excess calories contribute to the high obesity rates in the U.S. despite research indicating many Americans want to eat healthier. A 2016 Pew Research poll found 73 percent of Americans are fairly focused on healthy and nutritious eating, yet their diets are unchanged. Menu labeling could help dispel some common misconceptions about calories. Salad, for example, seems like it’s always the healthier option. However, a Wendy’s Spicy Chicken Salad has about 720 calories and almost a day’s worth of sodium. The Cheesecake Factory Grilled Chicken Tostada Salad has 1,600 calories. Health experts point out that salads can be made healthier by putting the dressing on the side and using less of it. A New York Times report found that the typical Chipotle order contains about 1,070 calories – double the amount in a Big Mac. Many large restaurant chains support the policy and have already tweaked their menus. Sara Burnett, director of wellness and food policy at Panera, said providing caloric and nutrition information is about helping people make more informed decisions – not about discouraging any dishes. “If we are embarrassed about the food we are serving then we should not be serving it,” she said. Other restaurants have gone even further to deliver not just transparency through caloric awareness through menu-board labeling but have changed ingredients and menu options that deliver healthy meal options. McDonald’s has made several significant changes, such as switching from margarine to real butter and removing artificial preservatives from Chicken McNuggets. “McDonald’s USA has always believed in continuous improvement and we evolve our menu and the choices we offer based on input from our consumers to meet their changing needs,” said Cynthia Goody, McDonald’s Senior Director of Menu Innovation. To prepare for the policy, large-scale food service and facilities providers have spent several years collaborating with dietitians, food producers and food service staff to deliver healthy meal innovations. Dan Wainfan, Aramark’s associate vice president of health and wellness, said menu labeling is the last step in the process. The Aramark team also has redeveloped recipes and provided compliance training to staff. Menu labeling is just one part of the larger effort to address the obesity issue, Wainfan said. It’s equally important – if not more important – to provide information and tools so people feel empowered to change behavior, he said. Research suggests more information alone isn’t enough to improve eating habits. 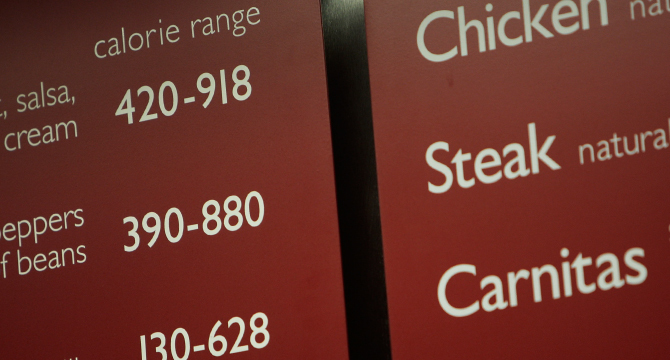 A 2009 study in Health Affairs found that calorie information on menus appears to increase awareness but doesn’t necessarily lead people to change their purchases. Rogan Kersh, provost and professor of political science at Wake Forest University and one of the authors of the study, said menu labels help put dietary options in perspective. Alice Lichtenstein, Gershoff Professor of Nutrition Science and Policy at Tufts University, agrees educational tools are important to change eating habits.